I'm not going to lie, every now and then I come across a product that leaves me dumbfounded. Sometimes because it's insanely beautiful or cool, other times because it's just straight-up weird. The Pjotr Spica Virginis belongs to the latter category... or no wait, it's actually both cool and weird at the same time! Even the box is 3D printed! It's made from nylon, then painted metallic copper. 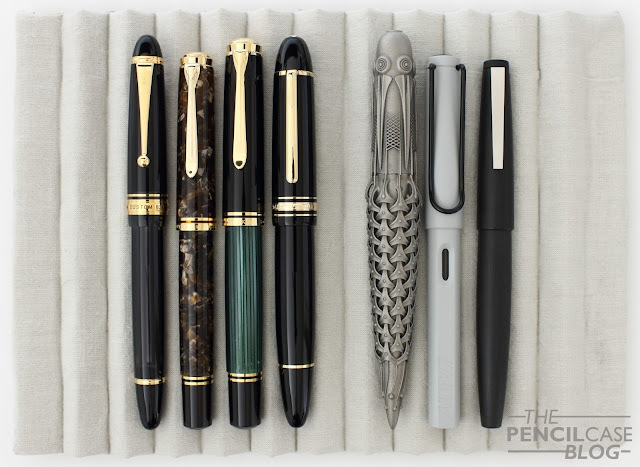 You see, there's a lot of variety on the pen market today, but Pjotr goes one step beyond just another design or writing experience. I've had the opportunity to talk with Rein, the man behind the brand, and he's all about revolutionizing the way pens -and other consumer products- are made... with the help of 3D printing! 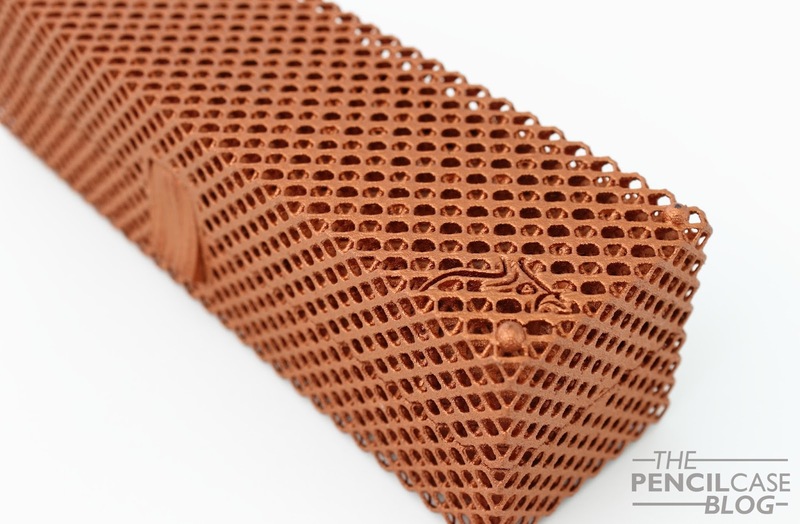 3D printing techniques have improved dramatically over the last few years. It has gone from novel industrial technique exclusive to research, to a readily available way of home-producing various products from scratch. At this rate, it's only a matter of time before all kinds of production evolve into some form of 3D printing (even 3D printed food or 3D printed donor organs(!) are becoming a thing!). 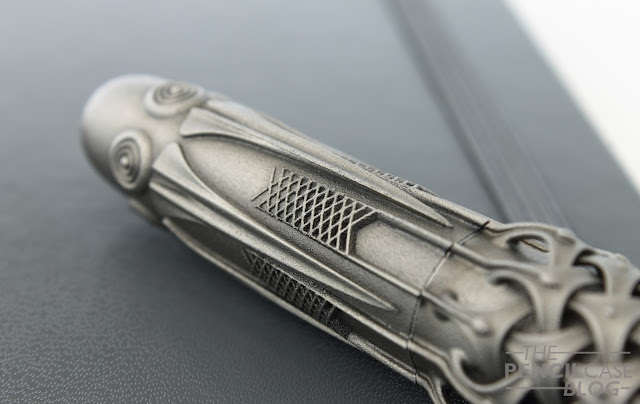 Rein -an engineer in the field of industrial design- has a lot of really cool ideas about 3D printing production and design, some of which are represented in his pens. But from talking to him, it really becomes obvious that Pjotr isn't just about the pens itself -in this case the Spica Virginis-. They are working hard on getting the technology out there and implemented (by working together with pen companies, but also expanding to other markets). The Spica Virginis can be seen as a concept product to show off the possibilities of 3D printing, and it does a damn fine job at that! What can I say? It certainly is something else! I won't say I'm a fan of the design, it's not something I'd be inclined to buy. But if you follow me and my blog, you'll have noticed I'm more into minimal and modern design, I'm just not that into ornate pens. I can, however, definitely appreciate the design of the Spica. Somewhat like fine art, or maybe because of the insanely cool technology and engineering behind it. Spica Virginis stands for the ear of wheat held by the virgin in the Virgo constellation. To stay in the 'space' theme, the overall design has a very 'alien-esque' extraterrestrial appearance that's really unlike anything else I've ever seen. Frankly, there are just too many design elements to talk about, so I'll let the pictures speak mostly for themselves. But the most prominent feature is definitely the representation of the ear of wheat on the body of the pen. 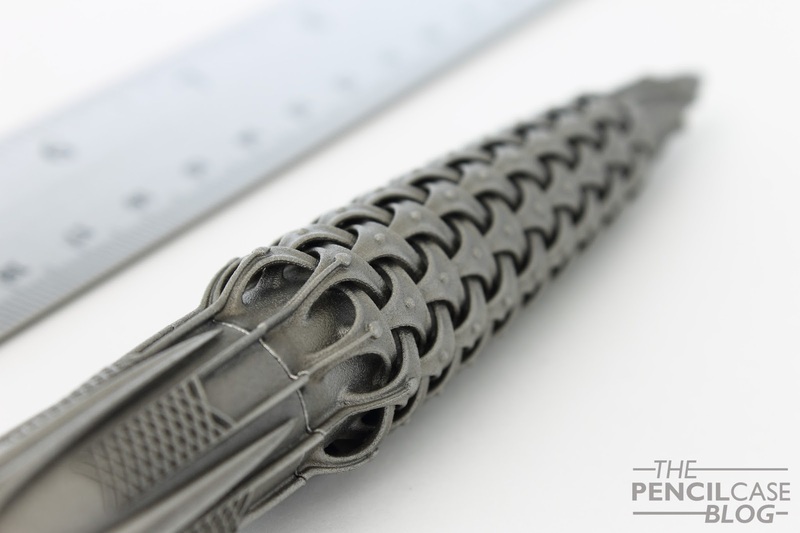 This braided 'overlay' structure on the barrel is what defines the entire pen, and it's fascinating to look at to be honest. Overlay is perhaps not the correct term to describe it, as it's all part of a single piece! Knowing that the entire barrel, including the braided structure, is printed in one go, is a pretty amazing feat on itself. Even more impressive is the build quality of the Spica. Pjotr clearly has access to high-end machinery, because there are no telltale signs of the printing process (no visible layered texture or imperfections). Apart from the cap finial and the edge of the barrel that are polished, nothing is changed after printing (no sanding, sandblasting or buffing). 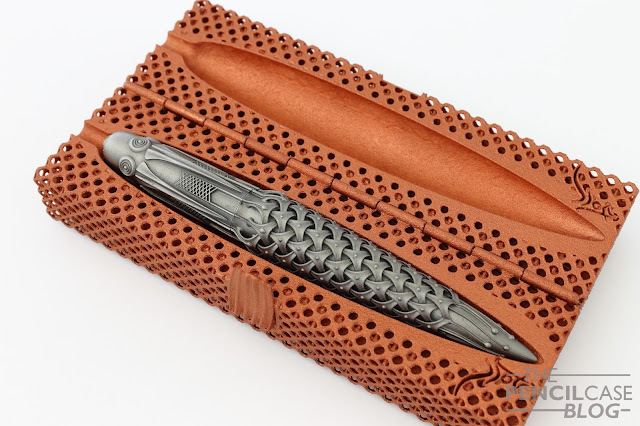 The printing process gives the surface of the pen a matte, textured finish that is really pleasant to hold. 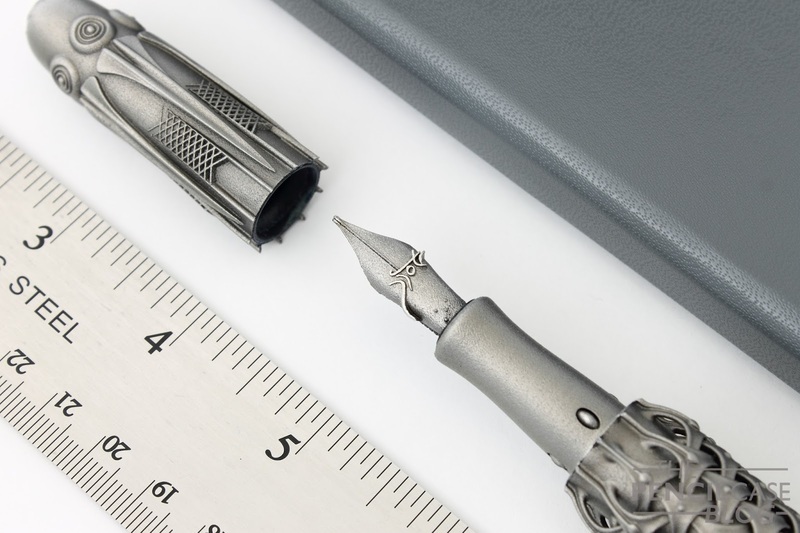 The barrel design adds a serious amount of thickness to the pen (the barrel measures 2.2cm at the widest part). The cap is much narrower than the barrel, which results in a rather strange profile when looked at from the side. The top of the cap is flat and polished, which provides a sharp contrast with the matte surface of the rest of the pen (the matte effect is a result of the printing technique). 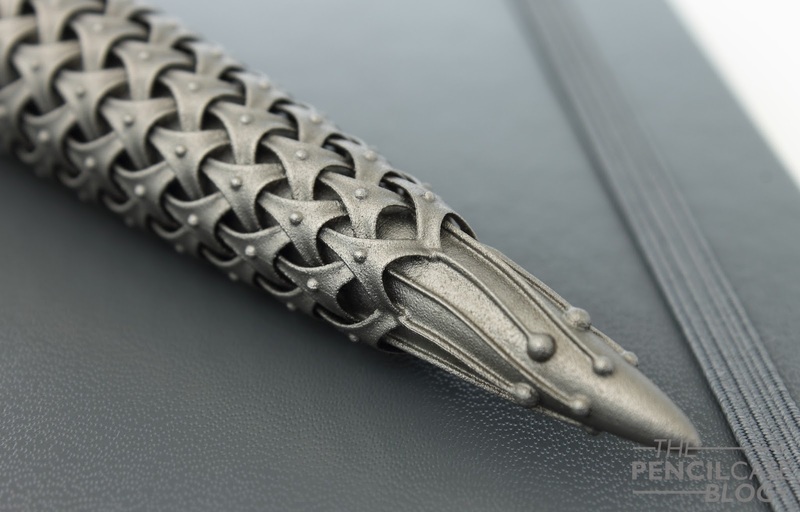 Pretty much every design aspect about this pen is highly detailed and unusual. As I said earlier, it's not the kind of design I'm particularly partial to, but it sure makes for an intriguing piece. The Spica is a very large pen at 15 cm (5.9") closed, and 14.7 cm (5.8") without the cap. The cap does not post at all, but it's more than large enough unposted anyway. Posting the cap would make it ridiculously long. Interestingly the Spica, despite being large and made out of titanium, is really lightweight. The total weight of just 32 g is achieved by printing the barrel walls hollow. 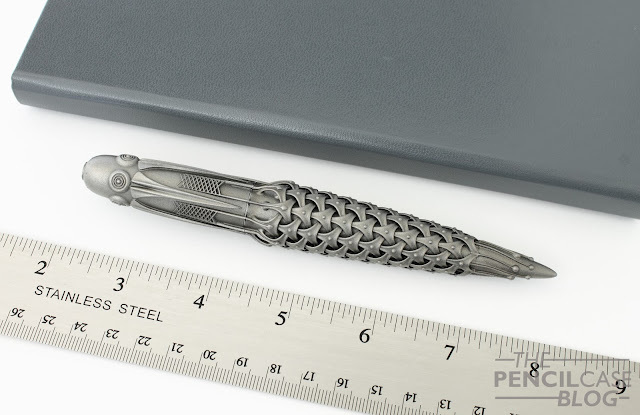 The complete titanium build warrants a strong and durable pen, even though the intricate details may seem fragile. Of course this isn't the kind of pen I'd recommend tossing in a bag (the pricetag alone...), but it does feel like it's sturdy enough to hold up to daily use. The design, while interesting to look at, isn't exactly 'Form follows function'. The section itself is nice and long, and has a comfortable taper, but there are quite a few sharp edges around the section that stick out. This can be quite bothersome if you grip your pen a bit higher up like I do. The matte surface finish offers a decent amount of grip to the metal section. Overall it's not a pen I'd recommend for heavy note-taking or writing letters, but it's definitely usable, not just a pretty piece of art to look at. The Spica uses a snap-on cap, which is held in place by the small ‘bumps’ at the base of the section. In terms of comfort, I do like that there are no threads, the slightly protruding bumps are smooth and hardly noticeable. On the other hand, the use of a snap cap does mean that the design that runs along the cap and barrel isn’t automatically aligned. You can rotate it to align them, but perhaps it would be cool to see this happen automatically (Like how the clip of the Montblanc M magnetically aligns with the rest of the pen). Pretty much everything about this pen is special, but the nib is extra special because it is also 3D printed in titanium using the same process as with the rest of the pen. 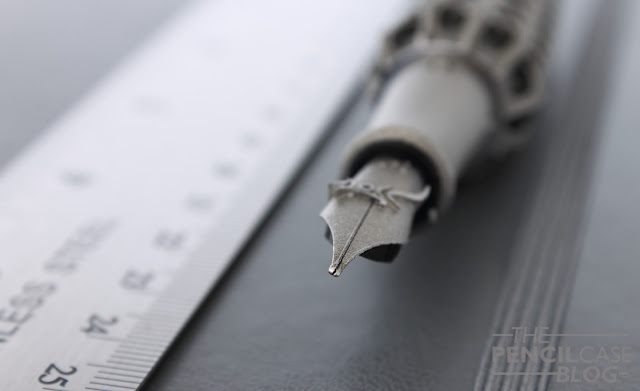 Even the nib slit is incorporated into the printing process, which is -just like the rest of the pen- an impressive engineering feat ( patented by Pjotr). It's modeled after a #6 Schmidt nib, and uses a Schmidt feed (along with the converter, the only non-printed parts on the entire pen). 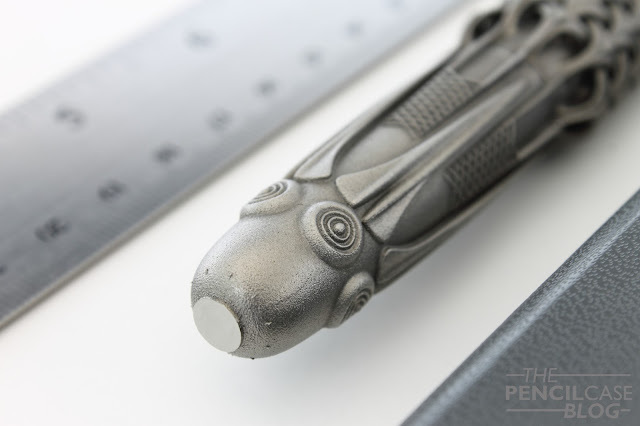 The design of the nib is fairly simple, with the eye-catcher being the raised Pjotr logo in the middle. The slit is printed with a slightly thicker inside edge (The picture below kind of shows what I am talking about), which creates a more consistent ink flow. The tipping itself is also printed, which means it can be made to size, although that doesn't really matter because it has to be manually ground into shape anyway. In any case, it works. And it works surprisingly well! The medium-broad nib is ground to a stub and it writes like a dream. Being titanium, it offers a good amount of bounce, and some line variation if necessary. The feed provides a generous flow and keeps up well. Since they are hand ground into shape, a wide variety of nib options is available. This was an incredibly difficult product to review. More so than the product itself, I think the idea behind the brand is interesting, and worth sharing. 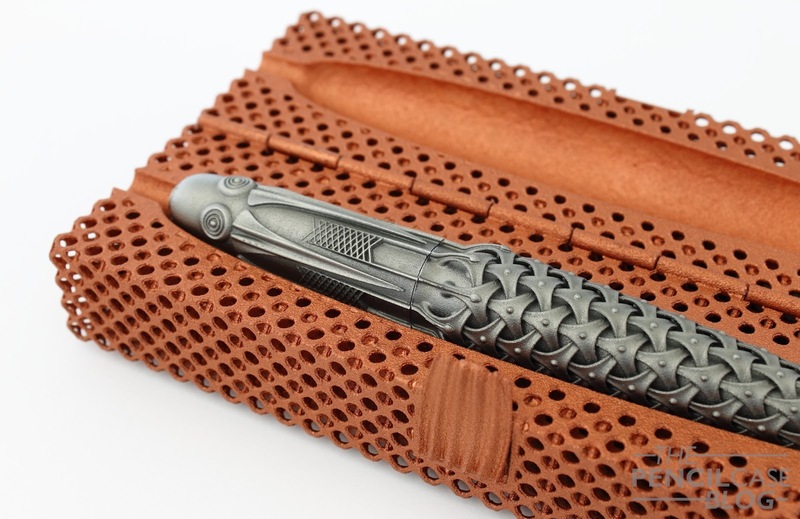 The Spica will definitely appeal to some, but I think the really interesting things have yet to come when they start to offer made-to-order custom pens. You should see Pjotr as an upcoming brand, trying to get settled. But once that has happened, the possibilities are virtually endless! For now, the daring design of the Pjotr Spica Virginis is kind of a hard sell. The retail price is quite steep, at 2500 euros (exclusively available from La Couronne Du Comte). Would I buy it? As I mentioned earlier it's not a design that particularly speaks to me, so even if I had the budget, I'd probably have to pass. But pf course that's just a matter of personal taste. There's no denying that it's a unique product, very well-made using a novel production technique. 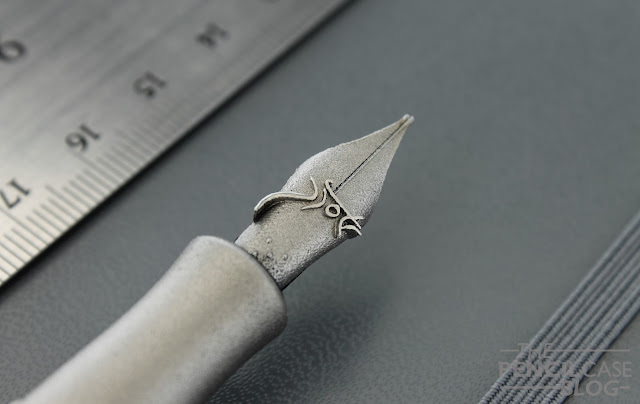 On top of that, the 3D-printed titanium nib is both great to look at and a very nice writer. There definitely is a lot to like about it, and it's worth looking into if you're in the market for something unique. In the end, after having spent a good amount of time with the Pjotr Spica Virginis, one thing is certain: I am definitely interested in seeing what Pjotr will come with next! Note: The pen I received on loan to review is actually one of the later prototypes, so there will be some small (mostly cosmetic) changes to improve the finish and detailing even more. 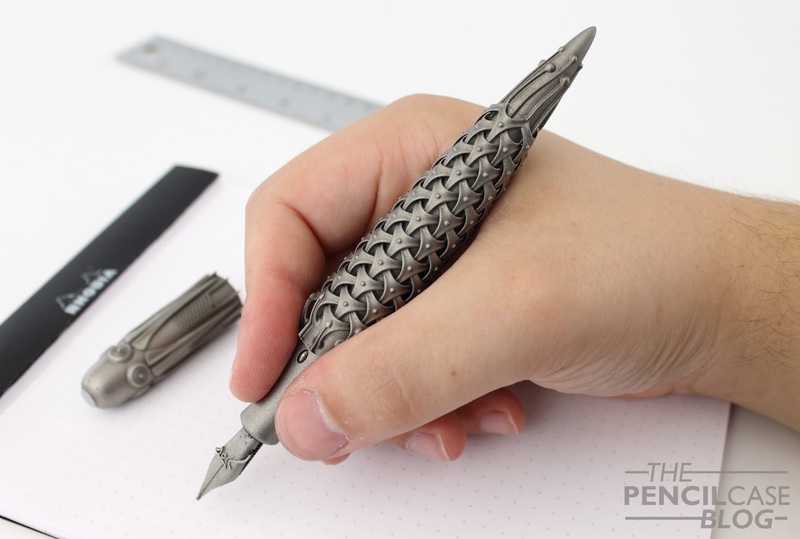 The final production run will feature the unique number of each pen incorporated into the 3D printed design. This product was sent to me on loan by Pjotr Pens so I could write this review. I was in no way influenced in the making of this review, the opinions shared in this review are completely my own! This post does not contain affilate links. Fascinating ! I appreciate your letting us know about this unique product. Thanks! Glad you like the post, it's an interesting pen for sure! The printing right on the nib and still having it maintain function is what blows me away. He's not just looking at how to make the parts of a pen prettier, he's inventing new parts altogether. He's really looking at the technology and pushing open a new chapter in pen design. Thanks for doing the review. This pen is, well, very different and the fact it is 3D printed is amazing. Thanks again. Where can I get one? It just so unique and awesome! Wow this is really nice. This just got added to my pen grail list. $2500 is a heavy price to pay... Ouch I think it will be on my list for a long time.